The blooming of toxic algae that occurs during the summer conceal a fight for life and death. Scientists at the University of Gothenburg, Sweden, say that algal blooms are created when aggressive algae kill and injure their competitors in order to absorb the nutrients they contain. "The behaviour of the algae can be compared to that of blood-sucking insects", says Per Jonsson of the Department of Marine Ecology. 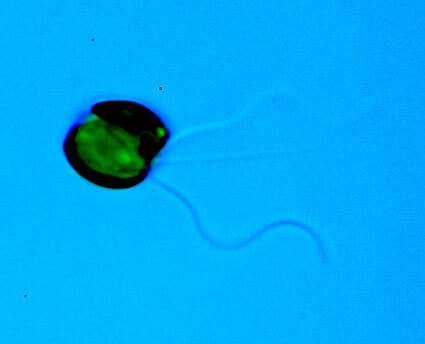 A light microscopy image of the microalga Chrysochromulina palpebralis. The blooming of toxic algae in the oceans and lakes is a familiar health risk and causes problems every summer, leading to increased costs for water cleaning, water consumption and the tourist industry. Scientists still do not know why algal blooms arise, and what it is that causes certain species of microalgae to multiply and form dense blooms. Scientists within the research platform MARICE (Marine Chemical Ecology) at the Faculty of Science, the University of Gothenburg, present a new possible explanation of why algal blooms arise in a study published in the international journal Proceedings of the National Academy of Sciences (PNAS). Current theory postulates that the algae produce toxins not only in order to inhibit the growth of competing species, but also to protect themselves from predators. The strategy of inhibiting competitors, however, is difficult to explain from an evolutionary perspective. The turbulent ocean surface means, quite simply, that it is difficult for one algal species to obtain exclusive rights on the effect of a toxin that inhibits competitors. The production of the toxin must be explained by other factors. Marine ecologist Per Jonsson and his colleagues suggest that the inhibition of competitors that previous research had found is only a side-effect of a considerably more aggressive behaviour: toxic algae injure or kill competing algae in order to gain access to the nutrients in their cells. "The way the algae absorb food is similar to that of blood-sucking insects, such as mosquitoes. Our study shows that this theft of nutrients may be an important mechanism in the formation of blooms of toxic plankton", says Per Jonsson. "The results will lead to several further experimental studies, and we hope that these will eventually contribute to solving the mystery of how algal blooms arise." The article "Formation of harmful algal blooms cannot be explained by allelopathic interactions" was published in PNAS on 15 June, and was written by Per Jonsson, Henrik Pavia and Gunilla Toth, all of whom are scientists working at the Department of Marine Ecology, University of Gothenburg.